Crafted of the finest heavy hand cast aluminum, this deep dish pan offers the buyer true versatility. Its generous 3-inch depth makes it perfect for lasagna, casseroles and scalloped dishes, while its large rectangular size makes it roomy enough for the largest roasts and hams. The crisp, clean contemporary styling and Excalibur non-stick cooking surface of the Lasagna Pan Plus offer beauty and function with minimum care. In addition to being attractive and versatile, the pan is designed for ease of use. 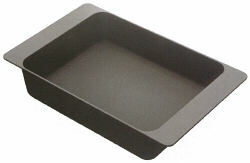 The one-piece design includes large handles on each end so the pan can safely be carried even when full to capacity. Fast, easy clean-up is assured with the Excalibur cooking surface and rounded edges. Compare this pan with anything else available today, and you will find nothing as robust, in such a unique size, and with such distinctive European styling. Measures: 10" x 12" x 3"